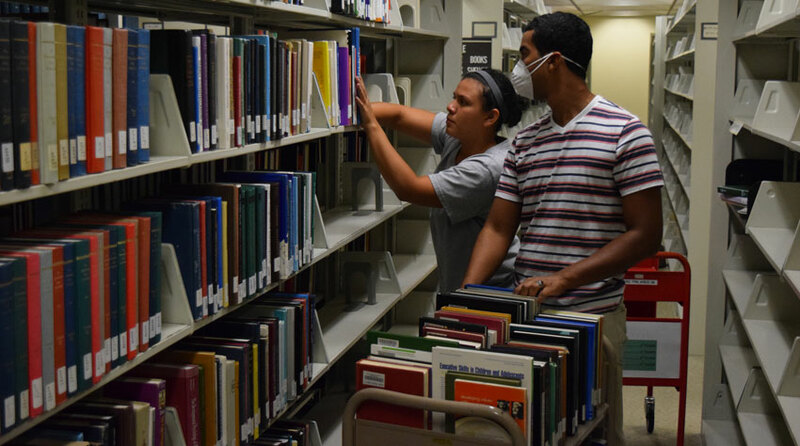 On Monday, June 29 the Stacks Unit in Circulation Services began a shifting project that will involve moving nearly one million volumes over the course of the next several months. The shifting project will make space for the newly improved quiet study space, and all books must be moved off of the 5th floor. A team of student employees have been hired to work on this special project. The students must work with important attention to detail so all books are moved to the correct new location. The work can be hot, tiring, and dusty, and we really appreciate all the efforts of our student employees. The first floor shift is complete and call numbers A to F now reside on the 1st floor. Shifting is currently taking place on the 3rd floor of the library. Please ask for assistance if you have trouble locating any materials. The team has a lot of work ahead, but it will be worth the effort when UCF students have a newly designed quiet, comfortable study space in the library.